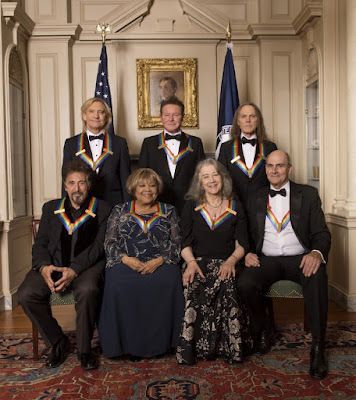 Bob Seger, Vince Gill, Juanes and the Kings Of Leon performed Eagles classics at the 2016 Kennedy Center Honors in Washington, DC earlier this month, and video from the tribute to the band is now available. Vince Gill delivered "Peaceful Easy Feeling" before co-writer Bob Seger rocked through the Eagles' 1979 single "Heartache Tonight" and the finale of “Life In The Fast Lane”, which saw the return of all the players to stage – including the evening’s host Stephen Colbert. Joe Walsh, Don Henley and Timothy B. Schmit were on hand for the December 4 event, smiling and cheering enthusiastically throughout the tribute, which was originally set for last year but postponed following news that guitarist and founding member Glenn Frey was to undergo major surgery to address a recurrence of previous intestinal issues, which would require a lengthy recovery period. Following surgery, Frey was placed in a medically-induced coma at Columbia University Medical Center in New York City, where he passed away on January 18, 2016 at the age of 67 from a combination of rheumatoid arthritis, colitis and pneumonia. The event was a billed as one-time only special tribute to Frey, with Henley telling the BBC in March that it was the group’s farewell performance.